Your body should maintain a balanced level of ear wax production, but when that balance is disturbed, it can result in discomfort. Similasan Ear Wax Removal Kit can help temporarily relieve your discomfort by removing excessive ear wax while cleaning the ear. It helps naturally maintain normal wax levels without harsh peroxide. 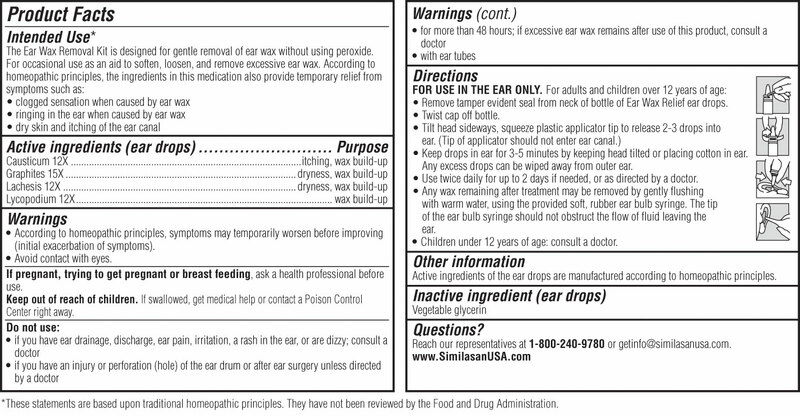 Ear Wax Relief ear drops stimulate the body's natural ability to reduce ear wax congestion, while the bulb syringe flushes excess wax and cleans the ear. Now you can relieve that clogged sensation, ringing and itching in the ear canal without drying your ear. A: The recommended dose is 2-3 drops per eye as needed. Keep drops in ear for several minutes. Continue use until symptoms diminish, twice daily for up to 3 days, or as directed by a doctor. Any wax remaining after treatment may be removed by gently flushing with warm water using the ear bulb syringe.